What is a digital signage player? A digital signage player is the component of a TV point responsible for displaying digital signage content. Most digital signage systems allow you to add/upload signage content to a content management service (CMS) and assign that content to one or more TV points. A digital signage player is responsible for downloading and displaying signage content from the CMS. This article will present a basic overview of digital signage media players. It will also introduce PowerPlayer, our low-cost media player designed to display PowerPoint digital signage presentations on your TV. PowerPlayer is an ideal media player and digital signage solution for small business and non-technical users. While you can purchase a TV display with an built-in digital signage player these products can be quite expensive and are typically used in high-end applications. For the overwhelming majority of TVs an external digital signage player is required. Without the signage player your TV is just that, a plain TV unable to connect to a CMS, download and display digital signage presentations. These external digital signage players are network devices–with integrated wireless or wired Ethernet–that connect to one of the TV’s source input ports; for example, one of the HDMI source inputs. They generally boot into a standard operating system like android or Windows and run digital signage media player software from the product vendor. An important feature of any digital signage product is its content creation capabilities. Most digital signage products offer a proprietary content creation tool. Three popular digital signage content file formats are HTML, XML and PowerPoint. Some vendors use Adobe® AIR® or require flash support to display signage properly. You must make sure the digital signage player software supports your product vendor’s file format. PC sticks and compute sticks represent a new class of low-cost digital signage player hardware used to display digital signage presentations. 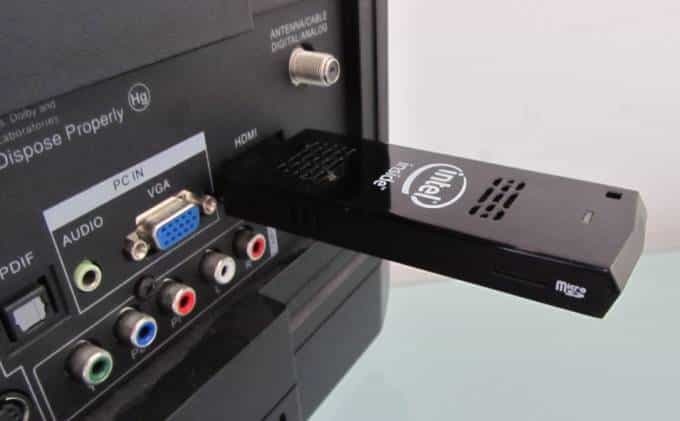 A PC or compute stick is a pocket-sized device that plugs directly into your TV’s HDMI port. Their small size and very low cost make them ideal for your digital signage player hardware. The majority of the PC and compute sticks come bundled with Windows. An important benefit of using a Windows-based stick is its support for the native PowerPoint® file format. With a Windows-based stick you can now support digital signage using PowerPoint, a simple yet powerful solution. And to keep operating costs low you can use the free PowerPoint viewer to display PowerPoint signage presentations–no need to purchase a software license for each TV point. For the small to mid-sized (SME) market there has been a slow adoption of digital signage. This has been due to cost and the perceived technical challenges. Most SMEs run cost sensitive businesses with little or no internal technical support. 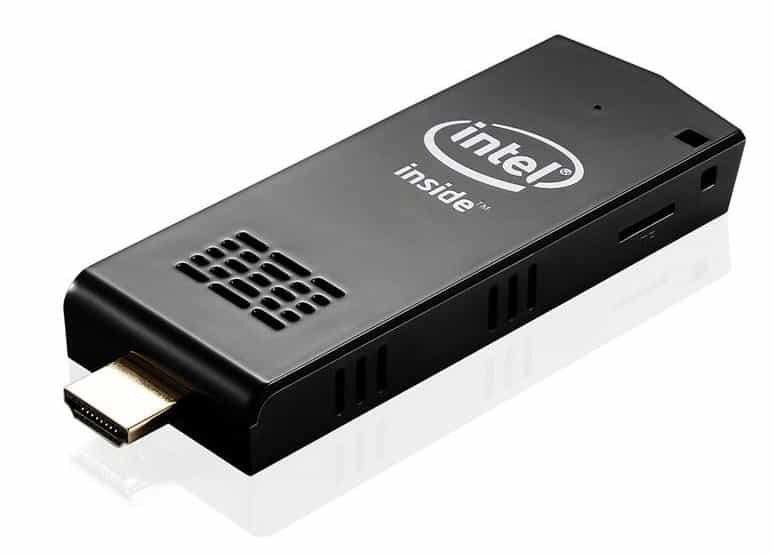 With the advent of Windows based HDMI sticks cost has been eliminated as a barrier to entry. However, most products are still too technical for average users. PowerPoint-based digital signage has eliminated these technical fears. Using PowerPoint for digital signage couldn’t be easier. It’s software you already know how to use. Leverage PowerPoint’s flexible layouts and widely available digital signage templates to create great looking content. Combine text, pictures, animation effects and cutting-edge HD video to produce multimedia signage that drive home your marketing message. Converting PowerPoint to digital signage is just a matter of designing for wide screen TV dimensions and setting up the presentation to auto-run. With PowerPoint digital signage workflow is achieved in three simple steps. Step #1: Create your signage presentation using PowerPoint. Step #2: Upload your PowerPoint signage presentation to the CMS. Step #3: The PC/compute stick downloads/displays PowerPoint signage presentation. To make PowerPoint digital signage easy we developed PowerPlayer™. PowerPlayer is a low-cost media player that displays PowerPoint digital signage presentations on your TV. 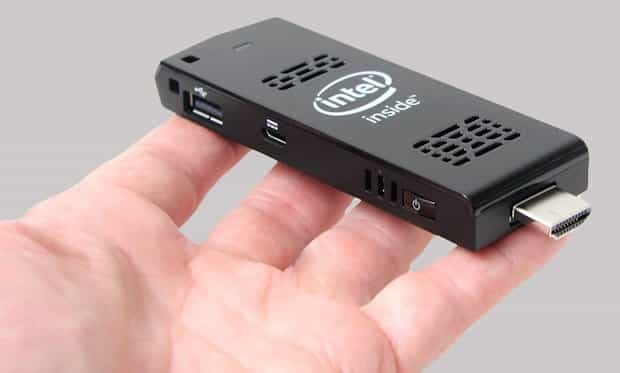 PowerPlayer is a pocket-sized Windows 10 mini-PC stick that plugs into your TV’s HDMI source input. PowerPlayer is bundled with PowerSignage™, our cloud-based content management service (CMS). PowerSignage CMS makes it easy to upload, manage and display PowerPoint digital signage presentations on your TV. PowerPlayer is plug-and-display ready. Plug PowerPlayer into your TV’s HDMI and it automatically downloads PowerPoint digital signage presentations from PowerSignage CMS and displays them on your TV screen. For more information review the PowerPlayer product brochure or visit our website at https://www.powerdigitalsignage.com. PowerPoint is a registered trademark of Microsoft Corporation. Adobe Air is a registered trademark of Adobe Corporate. PowerSignage and PowerPlayer are trademarks of Power Media Design Pty Ltd. Copyright (c) 2017 – Power Media Design Pty Ltd. – All rights reserved.